The free XMind mind mapper lets you develop your plans professionally, efficiently, and quickly on your PC. The software scope leaves very little to be desired. A structured approach is regarded as essential to success today. If you fail to "collect your thoughts," you are in danger of forgetting or overlooking some critical aspect in a scenario. The kind of environment you work in makes very little difference: Preparing and following up on calls and designing business models in a corporate environment need just as much planning as decorating your apartment or setting up a home network. To avoid losing track of complex projects and tasks, more conservative characters will tend to go for yellow sticky notes. But mind mapping programs give you a far more professional approach to managing collections of ideas. Although programs of this kind can be expensive on proprietary operating systems, XMind  for Linux offers an impressive range of features and a free license and tops the bill with a well thought out interface and simple controls. To be able to work efficiently with XMind, your PC needs at least 256MB of RAM, a CPU of at least 800MHz, and 100MB of free disc space. The use of the Eclipse framework Java developer environment necessitates these relatively high system requirements; this also explains why you need Java on your machine. Mind mapper is pretty choosey about its flavor of Java and will not work with free Java implementations; instead, it runs only on the original virtual machine by Sun Microsystems. This said, most distributions have the original Java application in their repositories. If in doubt, grab the software directly from the Sun page . The free variant of XMind, as well as a commercial version called XMind Pro, is available from the project homepage. Before you can download the program, though, you need to register . It is a good idea to use the prebuilt packages for Debian and Ubuntu (both 32- and 64-bit versions are available). In our lab, the 32-bit version ran without any trouble on a number of derivatives, such as Linux Mint. The developers offer a ZIP archive with a portable version on the download page for all other distributions. After completing the installation, you should see an entry for XMind in your Gnome Applications | Office menu. On Xfce, the routine installs a launcher in the Applications | Office menu. Clicking the entry gets the Java program rolling, but don't hold your breath. After a couple of seconds you get to see the program window, a large workspace, and, depending on your settings, one or two preference dialogs on the right border. A menu and a button bar at the top of the program window complete the settings and control widgets. Thanks to the clear-cut tab structure, using the program is an intuitive process, even if your project is complex. Immediately, you can start structuring the workspace visually, which can contain multiple worksheets in large-scale projects. Starting with main nodes, you can establish hierarchies quickly and simply in various ways with the use of logically organized icons. If you do not need a classical mind map, you can use one of a selection of alternative structures. XMind is suitable for designing legacy organizational charts, trees, or the less commonly used fishbone diagrams. XMind has a plethora of formatting and design options that help you visualize hierarchies, including the importance of individual nodes and their interdependencies. Besides various node shapes, such as ellipses, rhombuses, or simple rectangles, the program also supports color highlighting and lets you change the text size, aspect, style, and color (Figure 1). A selection of design options for connecting arrows and lines between nodes and for tagging with various symbols round off the content presentation options. If you like, you can even add a background image to your mind map. Figure 1: Thanks to the intuitive interface, newcomers should have no trouble achieving impressive results quickly with XMind. The program initially stores the results of your work in a proprietary .Xmind format. To use your mind maps in various third-party applications, XMind optionally lets you generate various image formats from your worksheets. On top of this, the application lets you convert structograms into text or HTML format. The latter is a big advantage if you are planning to present a large-scale project in a web browser as a separate site. XMind uses filters that let you import third-party mind map formats, such as FreeMind and MindManager, although the filters are only for the latest versions of these two programs. Just in case you do experience trouble using the program, XMind has a nicely illustrated help function. The XMind Help option, located under the Help menu, takes you to the help function, opening a new window that contains a glossary of keywords. The keywords and matching explanations are linked; clicking a search key takes you straight to the explanation (Figure 2). 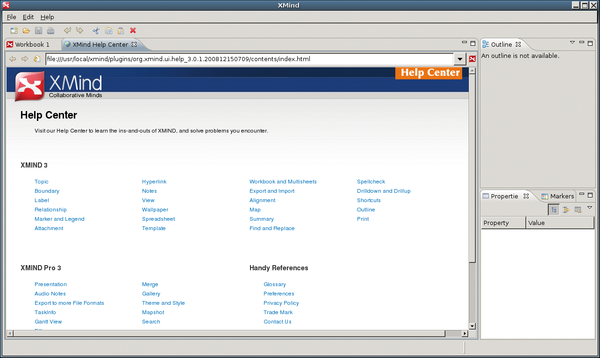 Figure 2: XMind integrates the help function in its own browser, which doubles as an integrity checker for any maps you export to HTML format. The miniature Web browser included with XMind is not just used to render help pages but also to check the integrity of site maps after converting to HTML format. The browser is also a useful collaboration tool. After creating a free shared account with the manufacturer, XMind Ltd., clicking Invite Friends to XMind.net under the Help menu of the application lets you collaborate with other subscribers on any mind maps you publish. To upload a mind map, select Publish in the File menu, or click the link in the buttonbar. This great feature enables groups to work across the miles. XMind is a strong contender in the sparsely populated mind mapping field. The software is attractive, with its typical Eclipse look and feel, simple controls, and huge functional scope. Amazingly, this first version of XMind should outperform many commercial programs. Besides freehand mind mapping, the program lets you create tree diagrams, organizational charts, and many variants of them. 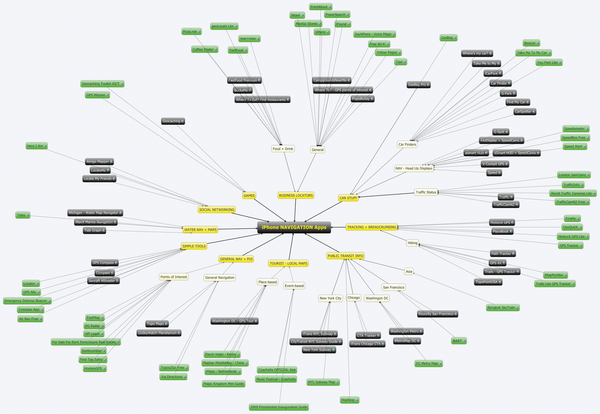 Its excellent design options and mature import and export filters allow for universal use of the mind maps you create. To top it off, the software offers collaborative functions that give multiple users the ability to cooperate on mind maps.